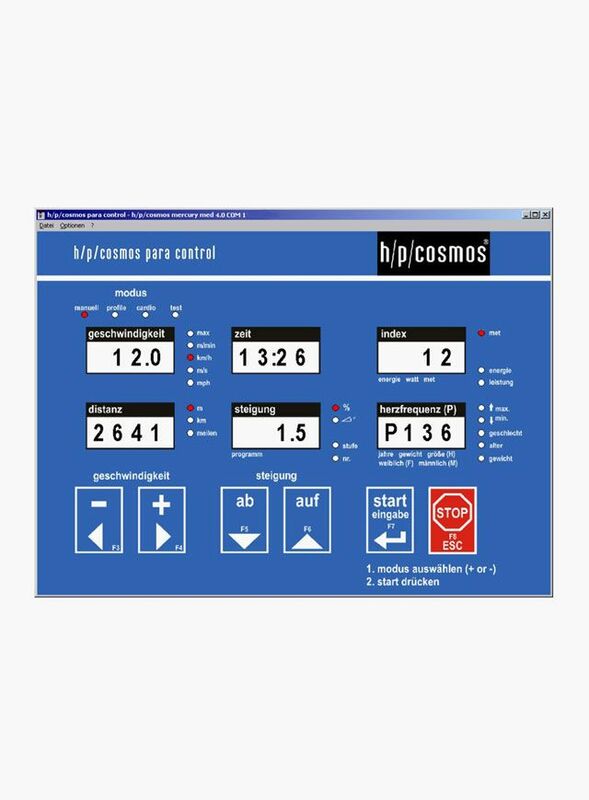 For remote control of all h/p/cosmos running machine and ladder-ergometers with MCU2, MCU3, MCU4 and MCU5. The parameters and the keyboard of the treadmill are displayed on the PC and keys can be simulated for remote control of the running machine or the ladder ergometer. PC software for sports and fitness applications. Not for medical and rehabilitation use! Read manual in full and all warnings and danger precautions of the PC software and of the controlled device (for example running machine) before use! free RS 232 interface port for connection of any peripheral equipment. Running-machine with RS 232 interface and selected coscom v3 protocol. If the UserTerminal is MCU2 or MCU3 type, then the EPROM firmware release must be at least V 2.31.